This model supports the function of monitoring twin pregnancy. It is the most commonly used cardiotocography system in Poland and one of the best on the market. Its reliable design ensures durability, combining the intuitive simplicity of operation with complexity of technical solutions. The machine ensures continuous, comfortable and safe monitoring of the cardiac activity and body movements of twins and of uterine contractile activity. A high-quality thermal printer ensures an automatic analysis of obtained cardiotocogram. The cardiotocograph is delivered with full accessories: a camera with printer, Cardio and Toco heads, foetus movement marker for pregnant mother, flexible belts, clamps which fix the heads on belts, high quality gel, thermosensitive paper, user’s manual. VOLUSON E6 of GE is a stationary ultrasound system, based on KRETZ technology and designed for applications in all branches: radiology, gynaecology, obstetrics, urology, cardiology and vascular examinations. The exceptional 3D/4D imaging technology of KRETZ, combined with high quality, light 3D scanning probes, guarantees high quality, spatial, diagnostic images, which are FDA approved. The maximal scanning speed in 4D mode is 40 spatial scans/s, what provides full motion picture in display. Modes of operations: Virtual Convex, ß -View, harmonic imaging, colour Doppler, power Doppler pulsating Doppler, tissue colour Doppler, spatial compound imaging, tomographic imaging, volumetric measurements, 3D imaging of foetal heart and panoramic imaging. The ultrasound supports state-of-the-art, multi-frequency electronic transducers: convex, 3D/4D convex volumetric, linear, endocavitary, 3/4D endocavitary volumetric, transfontanellar volumetric. The unit has got an incorporated database of patients with an option to record images and image loops. There is a DVD-R/RW recorder for image archiving and export (available formats: DICOM, JPEG, TIFF, AVI). 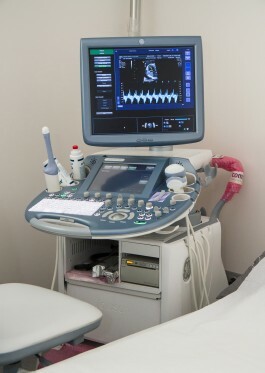 A touch screen (LCD) control of the ultrasound functions guarantees high quality examinations to be done in very short time. The VIDAS PC Analyser is used for immunodiagnostic tests by the enzyme linked immunofluorescent assay (ELFA). 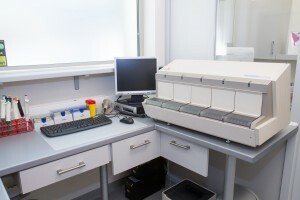 The VIDAS PC analyser includes a test reader, a peripheral computer with Windows software, a monitor, a keyboard, a mouse, a peripheral printer and a barcode reader. Five autonomous testing stations, each for 6 tests, enable simultaneous assays of various parameters. 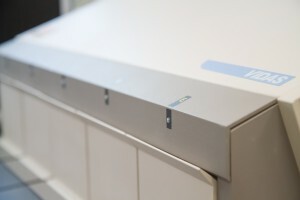 Tests in the VIDAS system involve two elements: a strip with ready-made reagent cavities and a constant phase carrier, i.e., a disposable pipette, coated inside with antibodies or antigen. 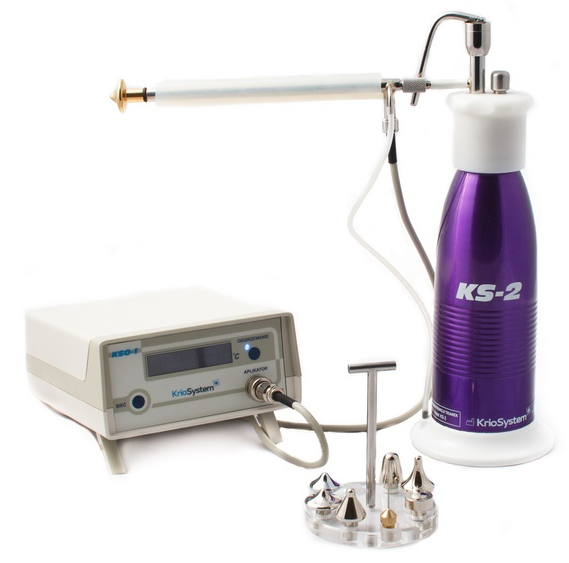 This pipette is referred to as a solid phase receptacle (SFR). One SPR/strip set is used for assay of one parameter in one patient. 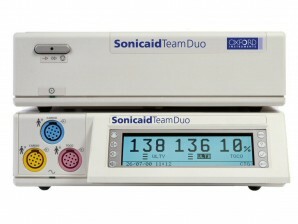 Beside the tests, the system includes also calibrators, quality controls and sample diluters. The VIDAS PC is a needleless analyser, what eliminates the risk of transferring infectious factors onto medical staff or of the assayed component between samples. The necessary manual activities in the tests have been reduced to a necessary minimum, including blood centrifugation and serum (or other studied material) pipetting onto the strip. The analyser does not require daily maintenance. An automatic self-testing mode (of the system itself and of reagents) guarantees high quality of results. 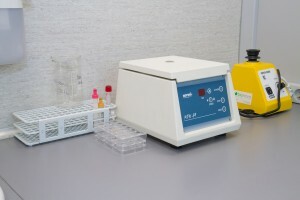 The calibration curve is designed by the manufacturer as a barcode unit for each set of reagents and is automatically entered into the computer memory from the card, enclosed to the test kit (or by a barcode leader). The curve requires recalibration every 14 days. The cost of test is the same, regardless of the mode of operations (big series or single tests). The waiting time for results varies from 17 to 120 minutes, depending on test type.